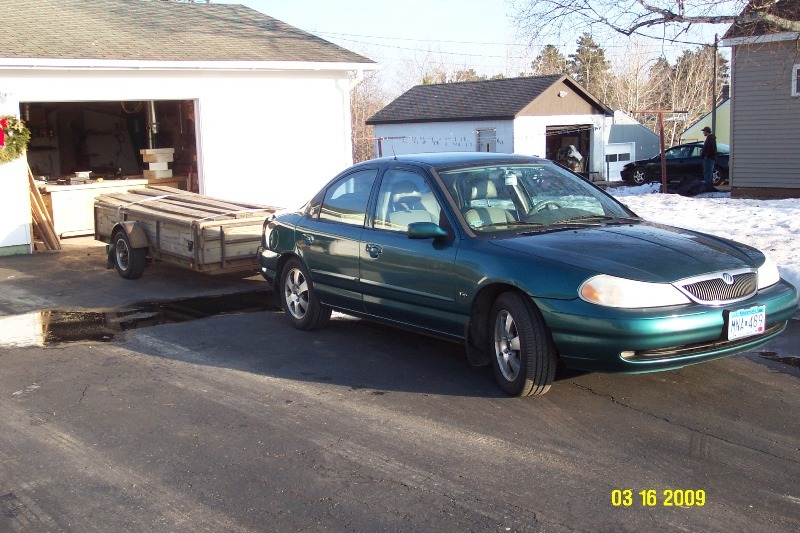 This is a trailer that my brothers, my Dad and I built so I had a way of transporting big loads as I only own a car. It has a tilt bed so I can slide heavy loads onto the ground. We built everything except the fenders and springs. We even built the axle, those wheels and hubs are off a Ford Tempo. 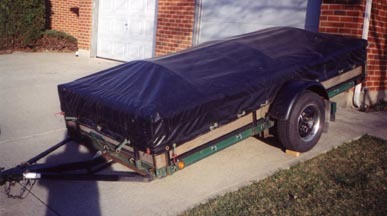 I had the cover made to fit this trailer as I regularly haul loads to my parent's house, around a 900 mile trip one way. It makes life much easier. I made one trip (in a rainstorm) before I decided I needed a good custom cover made. Here I have it hooked up to my car. I have a Mercury Mystique with the 2.5 Liter Duratec V-6 with a 5 speed manual transmission. This is a 1941 WC18 Dodge Army Ambulance. My father bought it in the early 60's and has had it ever since. We have done a lot of work on it in the last few years, but not bodywork. It can really go through the snow, it has some weight to it (back in those days they used real metal). It sure is a pain when you get it stuck though!